2015 Conference abstracts, papers, posters and presentations are available below (see Program). IAA Press Release on Hypothetical Asteroid Impact Exercise Posed For IAA Planetary Defense Conference. The International Academy of Astronautics held its 4th conference from 13 to 17 April, 2015 in Frascati, Italy. The conference included an exercise where participants simulated the decision-making process for developing deflection and civil defense responses to a hypothetical asteroid threat. The threat scenario begun with the information on a hypothetical object presented at http://neo.jpl.nasa.gov/pdc15/. Conference participants were invited to use the information presented there for analyses of the possible nature of the threatening object, for examining the decision-making process for actions related to possible evolution of the threat, for assessing possible deflection options should the probability of impact increase, and for estimating the consequences of impact should that be the eventual outcome. That page will be updated with a NEO Deflection App shortly to aid in these analyses. Updates to information on the threat and the threatening object were provided each day of the conference. The last day of the conference was dedicated to the final response to threat, potential consequences of impact, and possible disaster recovery issues and options. 2015 Conference abstracts, papers, posters and presentations are available below. The Conference Program is also available in pdf format. Debbie Lewis, Creative Resilience Ltd. The 2015 PDC will include an impact threat exercise, where participants will simulate the decision-making process for developing deflection and civil defense responses to a threat posed by hypothetical asteroid 2013 PDC15. Information on the evolution of the threat up to the date of the conference will be posted at a website to be announced. Attendees are invited to use 2013 PDC15 as a subject for their own exercises and for papers that might be presented at the conference. Priority slots for presentation of papers focused on aspects of the 2013 PDC15 threat will be available. The final period of the threat’s evolution will be provided in periodic updates during the conference, and participants will develop a set of actionable recommendations based on that information. ABSTRACT SUBMITTAL: abstract submission (250 to 500 words in length) is now closed. Abstract submission (by email to iaapdc (at) iaamail.org) in the areas described above or related to planetary defense was open from September 01, 2014 until January 07, 2015 deadline. Please be sure to designate the topic area your paper addresses (see topics listed above). Letters of official acceptance will be mailed on or before January 21, 2015. Abstract submission date has been extended to 7 January 2015. Submission of abstracts is still requested as soon as reasonably possible, to allow initial evaluation to start, but as necessary abstracts will still be accepted through January 7 2015. PAPERS: The conference will use the “no paper, no podium” rule. Papers are preferred but Extended Abstracts will also be accepted. Papers are due by close of business on April 3, 2015. Revisions and corrections to previously submitted papers will be accepted within two weeks after the end of the conference. The formats for papers are specified on the conference web site. Accepted papers (including poster papers, and briefing charts) will be published on the official conference website. VENUE: Frascati is a town in the province of Rome in the Lazio region of central Italy. It is located 20 kilometres (12 mi) south-east of Rome, on the Alban Hills close to the ancient city of Tusculum. Frascati is closely associated with science, being the location of several international scientific laboratories. Frascati is renowned for its white wine, Frascati. It is also an important historical and artistic centre. Earth Observation missions of the European Space Agency are based in ESRIN in Frascati. Call for papers is now closed. Authors with an accepted abstract will have to use the IAA PDC 2015 paper template or extended abstract template and send it by email to iaapdc (at) iaamail.org before the April 3rd, 2015 deadline. Word format files are preferred but pdf format files will also be accepted. The conference will use the “no paper, no podium” rule. Papers are preferred but Extended Abstracts will also be accepted. Papers are due by close of business on April 3, 2015. Please send by email to iaapdc (at) iaamail.org your paper, extended abstract, presentation, poster before April 3rd deadline in order to be uploaded on the conference memory stick. (please contact iaapdc (at) iaamail.org if your material is too large to be sent by email). Revisions and corrections to previously submitted papers will be accepted within two weeks after the end of the conference. Accepted papers (including poster papers, and briefing charts) will be published on the official conference website. Abstract submission (250 to 500 words in length) was open from September 1, 2014 to January 7, 2015. Please be sure to designate the topic area your paper addresses (see abstract template). Letters of official acceptance will be mailed on or before January 23, 2015. Abstract submission date has been extended to 7 January 2015. Submission of abstracts is still requested as soon as reasonably possible, to allow initial evaluation to start, but as necessary abstracts will still be accepted through January 7, 2015. We advise you to book your hotel via the Esrin Travel Office. Please note that the daily transport is guaranteed only for the prebooked hotels. Should you not require hotel accommodation, you should still confirm your attendance by fax to the Esrin Travel Office so that you will be officially registered for the meeting and be able to gain access to the ESRIN site. A number of rooms have been pre-booked for the participants at special rates in several local hotels and will be reserved on a first come / first served basis. There will be a courtesy bus that will take you from any of the hotels mentioned in the Hotel Reservation form to ESRIN and back. It is quite easy to reach ESRIN by train from Rome to the Tor Vergata station. For those participants preferring to stay in Rome, below are the addresses of some hotels within walking distance of the Rome Termini railway station. The average cost of a single room with breakfast is € 150 – 200. Please contact them directly to make your reservation. In order to get an invitation letter from the organizers in Italy, please send a request to the Chair of the Local Organizing Committee with your full mailing address and passport number. Frascati is a town and comune in the province of Rome in the Lazio region of central Italy. It is located 20 kilometres (12 mi) south-east of Rome, on the Alban Hills close to the ancient city of Tusculum. Frascati is closely associated with science, being the location of several international scientific laboratories. been a centre of attraction for both Italian and foreign tourists. Earth Observation missions of the European Space Agency are based in ESRIN in Frascati. The seasonal average temperature is around 18 - 20 ºC. Official taxis located opposite the Arrival Halls are white vehicles and have a taximeter. If taking a taxi from one of Rome's airports, it is advisable to agree on the fare with the driver in advance. Tell the driver you wish to go to ESRIN, located at Via Galileo Galilei, 00044 Frascati. The ESRIN Centre is in Frascati, near the FIAT Iveco dealer on Via E. Fermi, in the "Area di Ricerca" (Research Area). You may pre-book your taxi in advance through ESA for arrival pick up at the airport, or train station by downloading and sending the ESA Taxi Request Form by fax to the ESRIN Travel Office. ESRIN is working with two taxi companies: 'Piccirilli' for ESRIN and the Castelli Romani area near Frascati, and 'Cast' for Rome. The two taxi companies have slightly different taxi fares however a taxi booked through ESRIN will not exceed the price indicated. From Fiumicino airport to ESRIN, the fare should not exceed €72. From Ciampino airport, it should not exceed €41. Night-time surcharge of 15% is usually requested for a journey commencing between 23:00 and 06:00. 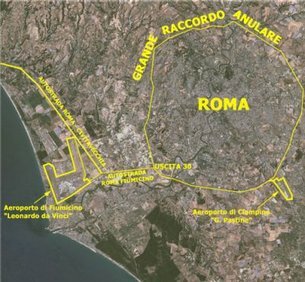 Rome Leonardo da Vinci Fiumicino airport is 32 km away from the centre of Rome and is linked to Rome by the Fiumicino motorway and the ring road (GRA). On leaving the airport follow the signs for ROMA. When you arrive at the ring road (GRA) turn right following the signs for Napoli. Continue along the GRA until you come to exit no. 21/22 signposted Via Tuscolana and close to IKEA and take the Via Tuscolana, direction Frascati. Just before Frascati turn left into Via Enrico Fermi at the traffic lights. After approximately one kilometre you will pass the traffic lights at the ENEA complex, keep straight on for 200 metres and then turn right onto Via Galileo Galilei, immediately after the FIAT dealer and before the Tor Vergata train station. On leaving the airport, follow the signs for the GRA, and take the Firenze/Napoli direction. Continue along the GRA until you come to exit no. 21/22 signposted Via Tuscolana and closed to IKEA and take the Via Tuscolana, direction Frascati. Just before Frascati, turn left into Via Enrico Fermi at the traffic lights. After approximately one kilometre you will pass the traffic lights at the ENEA complex, keep straight on for 200 metres and then turn right onto Via Galileo Galilei, immediately after the Fiat dealer and before the Tor Vergata train station. Exiting Rome from San Giovanni in Laterano square, take the Via Tuscolana in the direction of Frascati. Prior to arriving at the town centre on Via Tuscolana, turn left at the traffic lights along Via Enrico Fermi. After approximately one kilometre you will pass the traffic lights at the ENEA complex, keep straight on for 200 metres and then turn right onto the road that runs between a FIAT dealer and the Tor Vergata train station. The train with final destination “Frascati” arrives directly in the Frascati city centre and is the most practical connection if you go to a hotel in the centre of Frascati. The line for “Frosinone”, “Cassino”, "Roccasecca" or "Colleferro" destinations, with stop in Tor Vergata station indicated on the platform display, is ideal if you want to go straight to ESRIN since the station Tor Vergata is only 100 metres from the entrance gate of ESRIN. As the Tor Vergata station is far away from the Frascati city centre, you are not advised to take it if you want to go to your hotel in Frascati. Take the train from Termini station to “Frosinone”, “Cassino”, "Roccasecca" or "Colleferro" destinations and get off at Tor Vergata, one-way ticket price is around 2€. This stop is approximately 100 metres from ESRIN. Early bird registration until February 07, 2015. A tour through Rome in a Fiat 500 is optional (please see below). The registration of the accompanying person is free of charge. The accompanying person cannot attend the meeting but is entitled to attend the cocktails arranged at the venue. The gala dinner has a cost of 55 Euros per each accompanying person. Cancellations must be in writing and received no later than the 20 March 2015 (4 weeks before the conference). There is a 100€ cancellation fee for cancellations after 20 March 2015 and before 10 April 2015. Registrants who cancel after 10 April 2015 or fail to attend the conference will forfeit the entire fee. Sunday (12 April 2015) visit to the Campo Imperatore Observatory. The Observatory of Campo Imperatore is the one at highest elevation among the professional ones in Italy and is the one with the darkest and clearer sky. The Campo Imperatore Astronomical Observatory was born as observational site for the Rome Astronomical Observatory (OAR) well before INAF birth and nowadays is still one of the very few structures of this kind available on the Italian soil. The Campo Imperatore Observatory has a 600 m² area distributed on three floors. Below the Schmidt and AZT domes that measure 50 m² and 65 m² respectively, the main floor hosts the rooms for visitors, the telescopes control room, the integration lab, the office area and four bedrooms. See Rome through the windows and the open roof of the old Fiat 500! Just like most Romans do! You will be riding as passenger driven by a professional, following an itinerary that includes the most famous sites of Rome! You can choose the itinerary and preferred time to ride! Grand Tour, Secrets of Rome, Tour of the Hills, Roman Holiday, Night Tour, Christmas in Rome! It's an exciting, fun and very interesting experience! During the ride we'll stop to take pictures, enjoy views and, of course, have a gelato or cappuccino! You will just love this tour! The price is 280€ per car (140€ per person). Deadline for this price is 28 February; after this deadline the price may vary. Please note that 2 people can fit in one car (exceptionally also 3). The tour can be booked individually or in couples. In case of a single booking, please be aware that you might share the car with another participant of the 4th IAA Planetary Defense Conference. Sponsors are solicited for the 2015 conference at the $2000, $5000, $10000, and $15000 levels. $15000 Sponsors will be listed as primary sponsors of the conference and names and logos will be prominently displayed on all conference materials. $15000 Sponsors will receive seven complimentary registrations and a reduced, block-rate registration fee for up to 15 employees. $10000 Sponsors will be listed as primary sponsors of the conference and names and logos will be prominently displayed on all conference materials. $10000 Sponsors will receive five complimentary registrations and a reduced, block-rate registration fee for up to ten employees. $5000 Sponsors will be listed as sponsors and names and logos will be prominently displayed on all conference materials. $5000 Sponsors will receive two complimentary registrations and a reduced, block-rate registration fee for up to five employees. $2000 Sponsors will be listed as sponsors and names and logos will be prominently displayed on all conference materials. $2000 Sponsors will receive one complimentary registration and a reduced, block-rate registration fee for up to two employees.